There’s no excuse: these days, fish is easily available filleted, skinned and boned. But if you are a little bit squeamish about handling fish, allow Delia to explain just how easy it is. The very first lesson to be learned in fish cookery is to overcome your fear – and that’s because there simply isn’t anything to be afraid of. 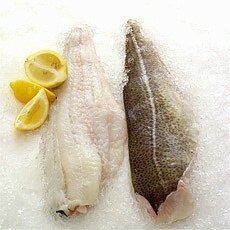 If fish is fresh it really doesn’t smell unpleasant – in fact the opposite is true. The smell of fish sizzling in the pan, and indeed with other methods of fish cooking, can be extremely appetising and if you keep your kitchen well-ventilated, with the window open or an extractor fan on, you won’t have any more of a problem with fish than you do with cooking other foods. Well, if that was ever a problem for you it certainly isn’t going to be now because that’s just what this guide is all about. There really isn’t any mystique because, firstly, handling fish is just like handling other food and secondly, nowadays when you shop from supermarket fish counters all the tedious intricate work like scaling, gutting, filleting and boning has been done for you. This means there’s very little handling to do and this will be made abundantly clear when you try any of the recipes on the site, which all come with an easy-to-handle guarantee. Not unless you want there to be. You can buy whole fish on the bone and some people prefer it, but if you are one of those people who hate bones, fear not because both on the fish counter and in the chill cabinets you’ll find that fish comes ready-filleted, de-boned and all carefully prepared for you. Skin is not a problem. I feel it’s preferable in some cases to leave it attached to the dish as it can give additional flavour, in which case all you do is simply leave it on the side of the plate. However, for some recipes it is preferable to remove the skin – it you have a fish counter in your local supermarket you can ask the fishmonger to do it for you, otherwise it is incredibly easy if you follow the following instructions. All you need is a flat surface and a sharp knife. First of all, angle the knife at the thinner or tail end of the fillet or, if it’s all the same thickness, start at one end. Cut a little bit of the flesh away from the skin: enough to get the knife angled in. Now, using all your fingertips, hang on to the skin, pressing it as firmly as possible, then push the knife with your other hand, keeping the blade at an angle – push at the skin rather than the flesh, remembering the skin is very tough and the knife won’t go through it. What’s happening, although you can’t see it, is that the knife blade, as it slides between the skin and flesh, cuts it away. If you’re not experienced, don’t worry if you’re left with a few patches of skin – you can just gently cut these away. Practice is all you need and you’ll soon be able to feel that the angle of the knife is right.